So this is exactly what the title says. You know that cream that goes ‘around’ the fruit that is put on top of cakes ? And thats it… yeah I know.. so easy right ? 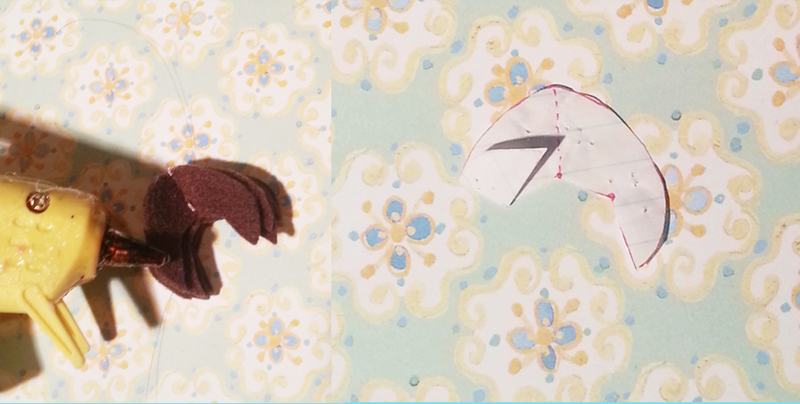 [Felt Crafts] # 9 – More variations of ‘cream’ ! Here are the next tutorials, each is very short and simple. 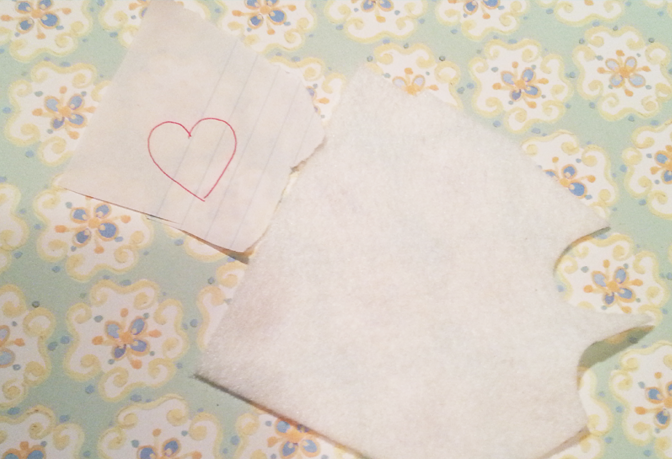 Template : Super simple, just heart shape. Twist it, arrange it and its done ! Hope you liked this, thank for reading ! 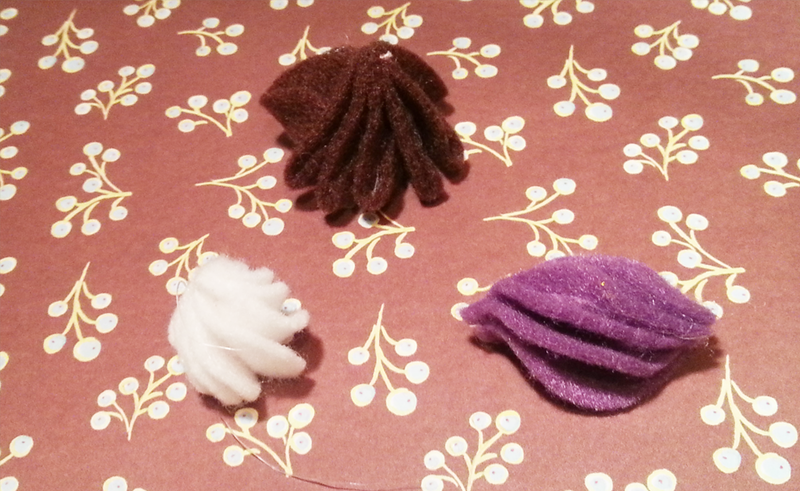 So I just spent a little time today making some more tutorials on felt. So for this template , the round part above those bottom dots are the main shape of the cream. The bits that come out after those two lower dots are to be folded and glued in. This created the ‘volume’ and detail to the cream. 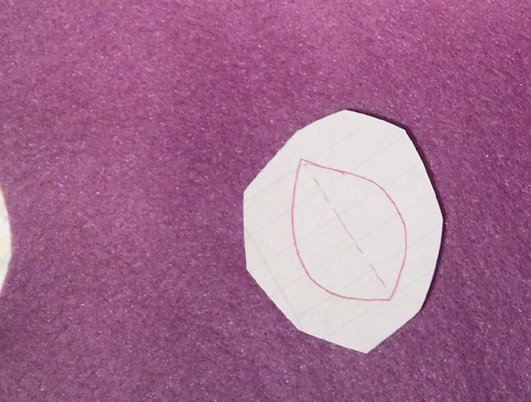 Remember when cutting your own template, fold it in half and then cut to make sure your get it exactly symmetrical. The shape is little strange right ? You have to kind of arrange those tab parts to make it look more cream like. Also, the more tab parts you have, I would imagine that the cream would look more full. So yes, there you go ! Next I will be uploading two or the rest of the three because they are so easy and fast to make ! I hope you liked this tutorial and that it helped you !! This is super simple, and it’s really up to you on what your ‘cream’ ends up looking like. However, if you don’t have the same tool I have, I’m not sure what you could use to replace it…. Using the rounded end, start making a ‘cream’ pattern on your clay. Do this by lightly indenting your design. 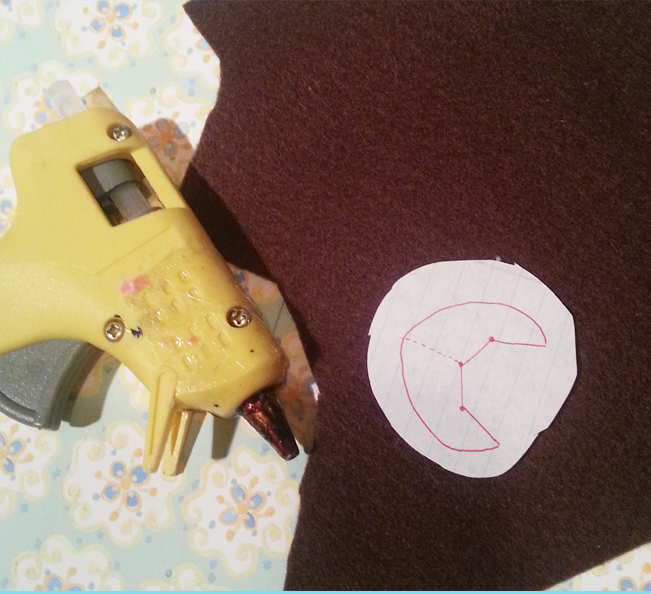 When you’re happy with it, go over the pattern with more pressure put on the tool. To define the bottom even more, use the pointed end of the tool and push the clay inwards. (First image) It should look something like this. Keep fixing your ‘cream’ clay until you’re satisfied with it. Super easy right ? I’m sorry if my ‘cream’ doesn’t look as good as the one in my previous tutorial. The shape really depends on you, so fix it however. Hope my explanation was okay….. Thanks for the reading ! 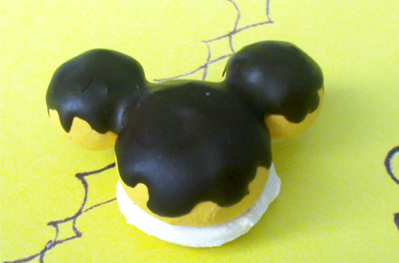 Another Mickey mouse themed tutorial today ! 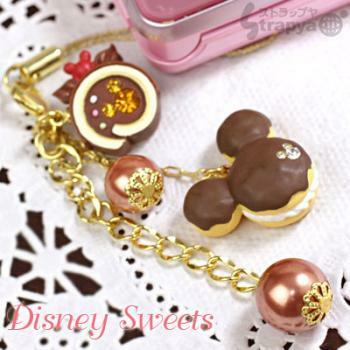 If you read my first tutorial that is the mickey mouse donut, you’ll know that I got these ideas from Strapya world. As you can see, I mixed the butterscotch colour with white to make it lighter. This is the bun of the cream puff. Make one ball + 2 smaller ones for the ears. 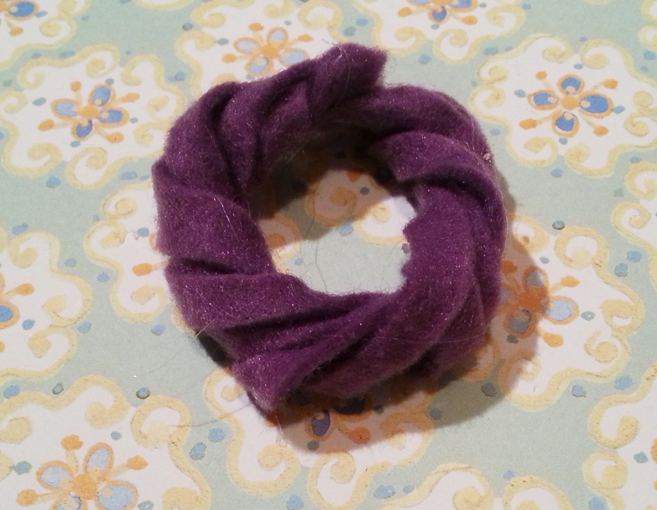 Make one half (of the larger ball) into a bun shape. Which is basically like a dome. You’ll see that in the third image, I made the ears level with the dome shaped clay. You don’t actually want this. When I put the ‘cream’ into the clay, and sandwiched the two pieces together, I found that the ears were not big enough…. this is a really bad explanation, you’ll see what I mean in the end. You see the bun shape ? Also, notice how the other half is significantly thinner. We don’t want it to be the same thickness as the dome. Add the icing onto the bun. Make sure when you add it, you give the ‘chocolate’ a ‘drizzled’ effect. The sculpey is thick enough to hold it’s shape, so don’t worry too much about it. You’ll see than the sculpey baked matte. This is what we want because it looks like real chocolate this way. 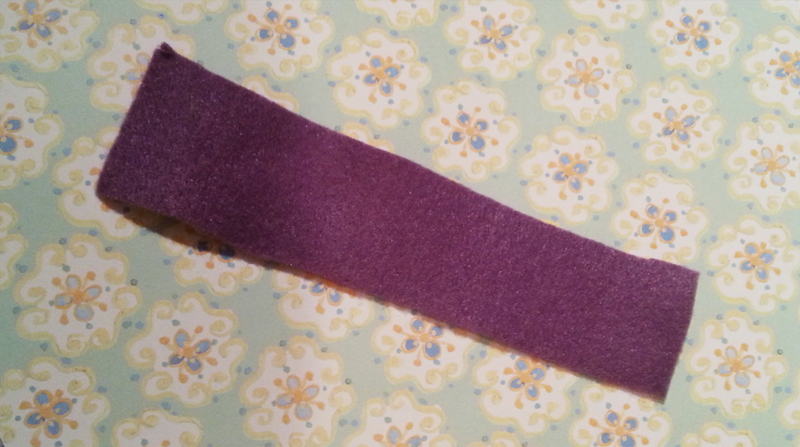 Fimo deco gel is quite light in texture, and will not hold its shape. Also, it finishes quite transparent. I am not using liquid clay + white clay. As you can see, it’s a type of tile filler. 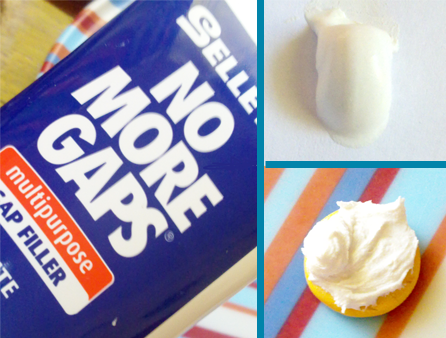 “Selley’s No more gaps”. Sandwich the top and bottom together and there! As you can see, the ears are not actually touching the surface… this is what I meant when I said to make the ears bigger. If you have a tiny piping tool, pipe the cream in. This way , it’ll have more detail. 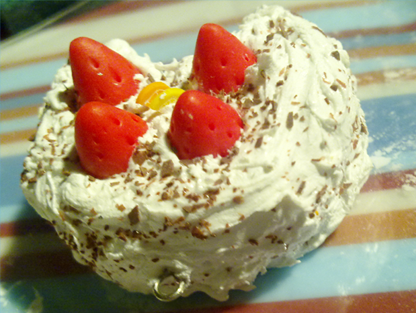 As promised, here is my tutorial on different types of whipped cream. Sorry it took so long.. 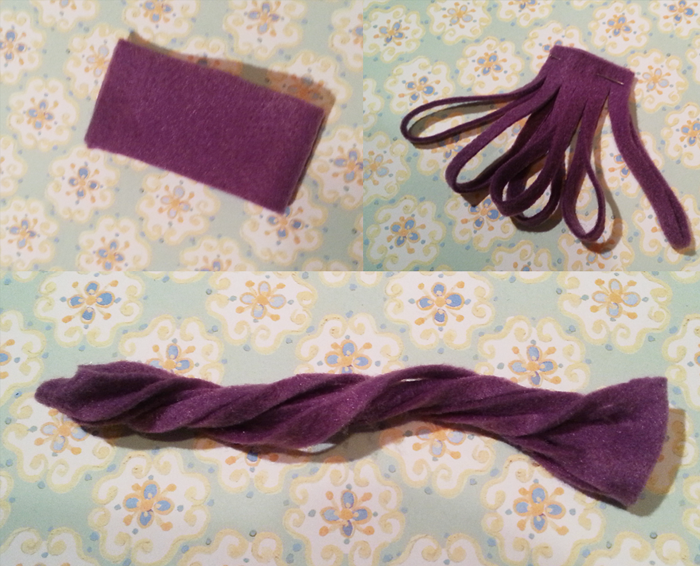 I finally went into crazy craft mode and made a lot of tutorials…. Some are still in editing stage and will be saved as drafts for later posts. I wasn’t actually going to post this one up so early, I was hoping to post the mickey mouse themed ones first, but since I think is is more helpful, here it is ! Sealant: I use a white sealant that is for tiles. It’s air dry, and I’m pretty sure there’s a photo of it somewhere in my previous posts. You see that normal blob ? That’s the sealant. The dollop of ‘cream’ next to it was piped out. I made a whole bunch and that was the best looking one. You see, the sealant’s consistency isn’t very thick, so some of the ‘cream’ that I piped out spread a little. This made them flat, and the pattern wasn’t defined as I would’ve liked. To thicken up your sealant, just add cornstarch or potato starch , or in my case, Tapioca flour. Mix mix mix ! The more you put in, the thicker it gets ! ( Try not to put too much, or else it’ll get sort of lumpy). In the third picture, you can see that it can hold the peaks ! This is good consistency. It takes about a day for the outside to dry (depending on the thickness of your cream), and probably about…… 2 days ? For it to dry completely. Although, depending on the humidity, it may take longer. Here is a cake that I iced with sealant. This was the day I thought of using starch to thicken it up, ohoho ! Also, since the sealant dries matte, make sure you glaze it afterwards. Here’s an extra comparison picture I took a few days ago. The one with the ‘cocoa’ powder is the sealant with tapioca starch added. Can you sort of tell the difference ? The pattern of it is much more defined, and sharp compared to the other one. The other one isn’t as defined, and it did spread a little. Cold Porcelain: Again, this is an air dry type of ‘cream’. The process of making this is basically the same as the TLS. As you can see, I am using PVA glue and cold porcelain. Find a container, or some sort of surface to mix the ‘cream’ in. Mix mix mix ! The thickness of the ‘cream’ depends on the ratio of CP:PVA glue. Here’s what it looks like on this random piece of clay. It sort of looks like the icing on buns right ? Ohoho, the consistency is quite thin here. I added more clay, and a litttle bit more PVA. Can you tell the consistency is thicker ? Let’s try adding some colour. I am using pastel. Using pastel doesn’t really give the ‘cream’ a very concentrated colour. Try acrylic paint if you want something more concentrated. Also, see how this consistency can hold the ‘peaks’. And again, just how it it looks like on top of that piece of clay. 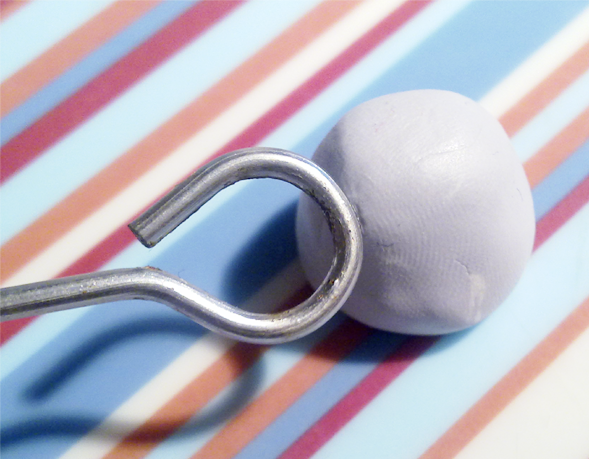 You can swirl the clay with a needle tool ( or toothpick). It will hold the swirls nicely. Now, the only concern I have for CP whipped cream are the cracks. If you do manage to make CP that doesn’t crack, then this won’t be an issue. Also, keep in mind that CP does shrink when it dries. This left little holes in the ‘cream’, but it’s not too noticeable, and should be fine. Translucent Liquid Sculpey: The steps for making translucent liquid sculpey is exactly the same as the CP version. Since it is basically polymer clay, all you need to do is bake to set it. This version of the ‘whipped cream’ is definitely the most time efficient ( since you don’t need drying time). However, it is also the most pricey. All you need is Liquid sculpey and the clay of your choice. You could use Fimo deco, but I find TLS is better. The steps are exactly the same as the Cold porcelain version. However, it does take LONGLONG to mix. It’s best if you make a big batch all in one go to save you time. When you start mixing, start off with a little bit of clay : TLS. This is because, you’ll need way more TLS than clay. Slowly add more clay to thicken the consistency. The second image is my batch of TLS. When I need to use it, I just take a little bit out, and add colour if I need to. Remember to bake it ! It’s best to add TLS after your creation is baked, this is so you have a more solid surface to work on. Puffy Paint: This isn’t really whipped cream, but puffy paint is AWESOME as drizzle. It isn’t that pricey, so yeah. The only downside is that, you can’t really pipe it out with a pattern. 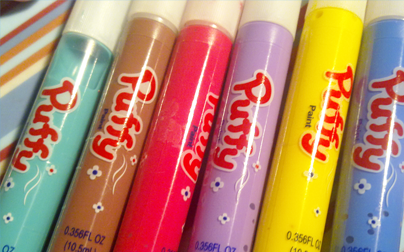 This is my puffy paint collection ! This all came in a pack,,,,, for about 4 NZD ? Don’t really remember. Here is the nozzle that usually comes with the puffy paint. This is what I meant when I said that you couldn’t really pipe it out with a ‘pattern’. The second image is just the colours. Notice in the third image , the colours are darker. Puffy paint gets darker as it dries. I just randomly made this cake with leftover clay…. sorry, it’s a bit ugly. Puffy paint takes about a day to dry ? You could use a hair dryer but when I did , it ended up spreading everywhere TT. Plus, if you blow dry it, you have to hold your creation, and then your fingers end up burning. Just let it air dry. Hot glue: Now this technique, I haven’t actually tried myself. I saw it on youtube a while back , and it is very effective as drizzle for deco den. The only thing is that you’ll have to buy coloured hot glue. I can’t really find them in NZ (only the glitter ones), so yeah. Aaaand there we go ! And as always, if you have any questions, just leave a comment ! 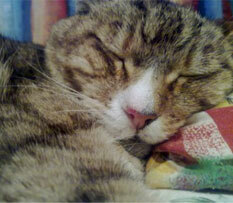 Thanks for reading, here's a cat !